The other vital aviation aspect of Britain’s leaving the EU is the bilateral route arrangements between the UK and the 27 nations of the European Union. A move by Norwegian, Ryanair and Wizz to register as British air carriers goes along with the government’s White Paper and reflects the general view that airlines throughout Europe will be happy with a deal that reflects the status quo. Coming 37 weeks before Brexit, the show attracted its highest global attendance ever, with around 100 countries present and record Chinese presence. 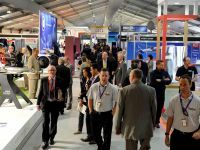 There was also a rise in trade visitors of nearly 10% compared to previous years, more than 80,000 passing through the gates on the trade days. The Airline Customer Programme asserted itself with 163% increase in attendance. Ten airline CEOs attended a round-table event, including Christine Ourmières-Widener of Flybe and Calin Rovinescu of Air Canada. In many respects, Farnborough 2018 was dominated by the Airbus takeover (51%) of the Bombardier C series project for €1 and renamed Airbus A220. One of the biggest beneficiaries will be the former Short Brothers plant at Belfast, a major supplier of components both to the Montreal assembly line and the proposed Mobile, Alabama, operation. The show A220-300 had been secretly repainted at East Midlands Airport, Derby, before being flown at night to Toulouse for its unveiling. Serial airline investor David Neeleman, he of JetBlue plus, among others, Brazil's Azul and TAP Air Portugal, sprang a surprise by announcing a commitment – 60 A220-600s for a yet-unnamed US airline. JetBlue itself announced an order for 60 A220s, a blow for Embraer, the carrier’s 100-seat supplier to date. The order book is now over 500 but, as of today (23 July), is not as yet shown on the Airbus database. 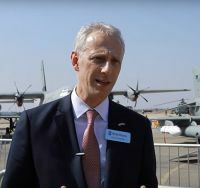 Rolls-Royce has been under pressure in recent times but Chris Cholerton, president – civil aerospace, was upbeat: “Farnborough is a highlight of the aerospace calendar and it’s a real pleasure to be back here, demonstrating the best of Rolls-Royce," he said. He was bullish regarding the Trent 1000 problems. 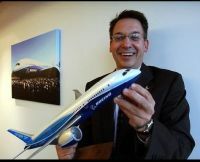 Boeing said it took orders and commitments for 673 aircraft with a total list price of US$98.4bn during the show and with chief analyst Randy Tinseth (nicknamed the ‘the sage from Seattle’ by one journalist – he got it right with the big jets hubs v point to point battle) – his 20-year outlook projects rising demand for 42,700+ new airplanes, valued at $6.3tr. No mention of the Boeing B777X in spite of repeated questions: “It’s on spec and on time”. Lead operator Qatar Airways was reticent too, but did announce orders for three simulators. Repeat customer British Airways committed to three more B777-300ERs, worth US$1.08bn at list prices. BA is one of the biggest B777 operators with a current fleet of 58 Dash-200ER and Dash-300ER aircraft. The B747-8 freighter continues to pick up orders with the backlog now 40 and production at one per month. Qatar Airways showed the second of its aircraft in a specially-designated cargo conference and static freighter aircraft area. Airbus announced it won new business for 431 aircraft at the show, and finished the week with an additional order from AirAsia X for 34 A330neos. The new business broke down into 93 firm orders and 338 MoUs, comprising 60 A220-300s, 304 A320-family aircraft, 42 A330neos and 25 A350s. That takes the Airbus total orders and commitments for the year so far to 752. For Bombardier, the concentration was now on the very successful CRJ series and the Q400 and a confirmation by Air Nostrum and CityJet that they were joining forces to create the largest pan-European regional airline group (See in this issue). It coincided with the unveiling of the first CRJ Series aircraft with the new “Atmosphere” cabin and Delta Air Lines aircraft on display, a key element the clever use of space to allow roller-bag capability. The Montreal-based company announced that its best-selling Challenger 350 aircraft has achieved Transport Canada’s steep-approach certification, with both EASA and FAA to follow allowing for operations at London City Airport. The long-expected tie-up between Boeing and Embraer was announced at Farnborough with Embraer's commercial airliner business placed in a new joint venture, with Boeing holding an 80% stake worth $3.8bn. No hard news regarding how the Brazilian company was going to tackle the 100/150-seat market but clearly plenty of grounds for co-operation with aircraft development and the supply chain. Embraer and United Airlines announced that they signed a firm order for 25 E175 jets in a 70-seat configuration. Including this new contract, Embraer has sold more than 420 E175s to airlines in North America since January 2013, earning more than 80% of all orders in this 70-76-seat jet segment. Since entering revenue service, the E-Jets family has received more than 1,800 orders and over 1,400 aircraft have been delivered. Today, E-Jets are flying in the fleet of 70 customers in 50 countries. Without doubt, Qatar Airways was the centre of attention during the trade days with the Airbus A350-1000 and the Boeing B777-300ER on display, both of which feature the airline’s award-winning Business Class seat, Qsuite. The airline also exhibited for the first time its Boeing B747-8 freighter, as well as Air Italy’s Boeing B737 MAX 8 in a striking new livery, Qatar Executive’s Gulfstream G500 jet and the JetSuiteX Embraer 135 jet. Al Baker was keen to talk about the airline’s international ab-initio pilot training programme and announced an order with its long-time simulator provider CAE for three Boeing B777X and two Boeing B737MAX full-flight simulators. Qatar Executive, the private jet charter division of Qatar Airways Group, unveiled its brand-new executive jet, the Gulfstream G500 setting new standards for passenger comfort. Claimed to be one of the quietest and most efficient jets in the industry, the aircraft’s remarkable range makes it capable of travelling non-stop from Istanbul to Cape Town; Los Angeles to London; and San Francisco to Tokyo. Qatar Executive expects to receive eight of the 25 additional new aircraft it has on order between now and the end of 2019. It currently operates a fleet of 13 ultra-modern Gulfstream and Bombardier private jets, including five Gulfstream G650ERs, three Bombardier Challenger 605s, four Global 5000s and one Global XRS aircraft. Earlier this year, it took delivery of its fifth Gulfstream G650ER aircraft, the fastest, ultra-long-range business jet in the industry, making Qatar Executive the world’s largest owner-operator of this jet type. The G650ER is renowned for its incredible 7,500 nautical mile range, industry-leading cabin technology and unparalleled passenger comfort. For ATR, it was once again a busy show, Air Lease Corporation ordering seven ATR 72-600, Myanma Airways planning for up to 12 ATR 72-600 and Nordic Aviation Capital ordering 75 ATR 42-600s. Silver Airlines of Florida stood out, ATR displaying the airline’s new livery, a bold flamingo pink, as it heralds what will be its first North American customer for the new ATR-600 series aircraft. The Franco-Italian manufacturer announced the delivery of the one thousandth ATR 72 to leading Indian domestic carrier, IndiGo. 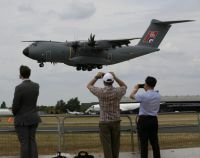 The Mitsubishi MRJ90 made its international airshow flying debut at Farnborough 16 July but was then withdrawn following a collision at the show when a ground support truck ran into the nosecone. The first flight of the MRJ was in November 2015. After several delays, deliveries are now scheduled to start by mid-2020 for the 90-seat plane. Sad to say there are always incidents at even major air shows, fortunately in recent times nothing serious.